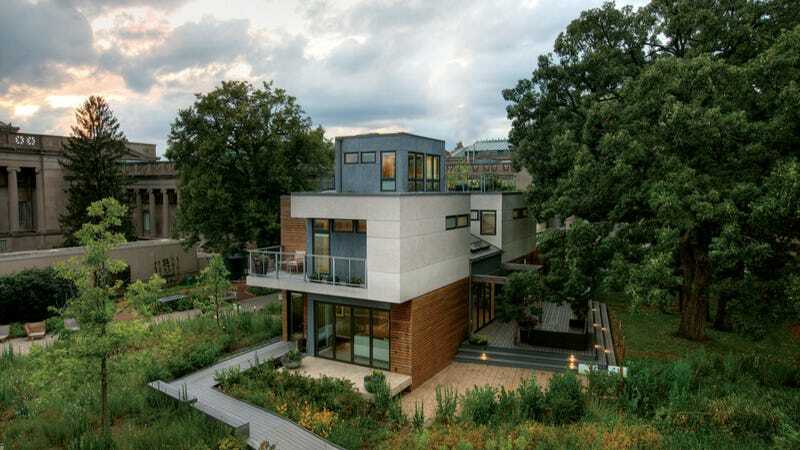 As you may have heard, Gizmodo and the Museum of Science and Industry, Chicago have partnered to curate the technology for this year's 2011 Smart Home: Green + Wired. The yearly exhibit features guided tours of a modular, eco-friendly home built on the museum grounds and designed to highlight the bleeding-edge of domestic technology. And not only did Gizmodo distill its essence into the Smart Home, MSI did an incredible job of making this a home you'll wish you lived in. The Museum of Science and Industry itself is housed in the only remaining building from the 1893 World's Columbian Exposition and is one of the largest science museums in the world, certainly the largest science center in the Western Hemisphere, and features nearly 14 acres of hands-on exhibits. It was built as the Fair's Palace of Fine Arts by Burnham & Root architect Charles Atwood. The museum grounds and building are beautifully picturesque, creating a perfect setting for the 2011 Smart Home. Now, the 2011 Smart Home isn't just a few gadgets under glass - the building itself is part of the show and is designed for the rigors of family life. Specifically, it was designed with a family of three in mind - two parents and an astronomy-obsessed 10-year-old. From its energy-efficient heated radiant subfloors and Low-E windows to its mechanized shading system and AMX automation system, the Smart Home is an embodiment of efficiency and intelligence. What's more, the Smart Home exhibit celebrates revival, featuring recycled and repurposed furniture from Chicago home interior store Scout, the 2011 Smart Home design partner, throughout the house. This trifecta of ideals - efficiency, intelligence and revival - are illustrated in each room of the Smart Home. Three rooms especially stand out to us, both for their personification of these ideals and their overall awesomeness. The Master Suite, for example, features both a gorgeous set of Ping Lamps - divided from a single time-worn globe, lit at the hemispheres - displayed on a set of beautiful mid-century, high-gloss bedside tables. A few feet away in the master bath, a solar-powered toothbrush rests under a network-connected, bathroom cyber-mirror capable of displaying the day's news and weather. The bathroom floor is tiled with bricks reclaimed from old factory demolitions in Chicago area while the 50-year-old Simmons bedroom dresser has found new life in this home. The Boy's Room boasts some of the coolest gadgets in the entire home and more toys than our wildest Toys-R-Us dreams. Among our favorite curated items are the SkyProdigy130, an automatically-aligning smart telescope that displays a readout of you're looking at; the Parrot AR.Drone, a deadly but super fun iOS-controlled quadcopter; and the Getting Started with Arduino kit, an interactive everyman's, or boy's, guide to electronics theory. This room is definitely one of our geekiest. The theme of Efficiency extends beyond just saving energy in the Smart Home, the conservation of time and effort are equally paramount. The work table at the heart of the home office was reclaimed from the industrial corridor on the westside of Chicago. The titanium blades of the Fiskars Cuts+More Scissors multitask as an awl, wire cutter, rope cutter, knife and bottle opener. Even the Sharpie Liquid Pencil pulls triple-duty - writing like a pen but erasing like a pencil until it dries 24 hours later and sets like a permanent marker. The Smart Home also features some timeless design, green home furnishings provided by SCOUT, a local Chicago business specializing in vintage and refurbished furniture finds. The Dining room chandelier for example, displays a set of fluorescent lights that functioning as a shade for LED spotlights. The Living room has one of our favorite items in the entire house, gadget or otherwise: a set of Knoll chairs upholstered in RubbRe, made from recycled rubber. Anyone with the vision and foresight to wrap Knoll chairs in old tires has our respect. Conservation doesn't stop at the front door. Every aspect of the Smart Homes' landscaping and gardening has taken stringent sustanability goals into account. Space is maximized via an extensive trellis system and a green roof helps reduce energy consumption inside while permeable pavements and rain gardens minimize rain runoff. Fresh vegetables and herbs are available during three seasons and two hives, housing more than 60,000 bees during the summer, that produce honey and the occasional Bee-Beard hijinks. Obviously, we are honored to curate the technology for this year's exhibit. MSI is an incredible science museum and one whose passion for technology matches our own. Frankly, if you're reading this and are in the Chicago area, stop. Step away from the computer, put your phone in your pocket and head over to MSI because, well, this exhibit is electric. Opportunities to actually see the stuff your read about in person don't come along very often and they're even more rarely shown in a manner as unique as this. It would be a shame to miss this experience. The exhibit runs from Earth Day, April 22, 2011 through January 8, 2012. You can find more information here about the 2011 Smart Home exhibit and MSI, Chicago.